Excess combat damage dealt by Hill Troll (damage that is dealt beyond the remaining hit points of the character damaged by its attack) must be assigned as an increase to your threat. Forced: Each time Marsh Adder attacks you, raise your threat by 1. Forced: If Wargs is dealt a shadow card with no effect, return Wargs to the staging area after it attacks. Forced: After the players travel to The Brown Lands, place 1 progress token on it. When faced with the option to travel, the players must travel to The East Bight if there is no active location. Forced: If Banks of the Anduin leaves play, return it to the top of the encounter deck instead of placing it in the discard pile. When Revealed: Each player raises his threat by the total Threat of all cards in the staging area. Any player may choose to discard from play 1 Creature ally card he controls to cancel this effect. 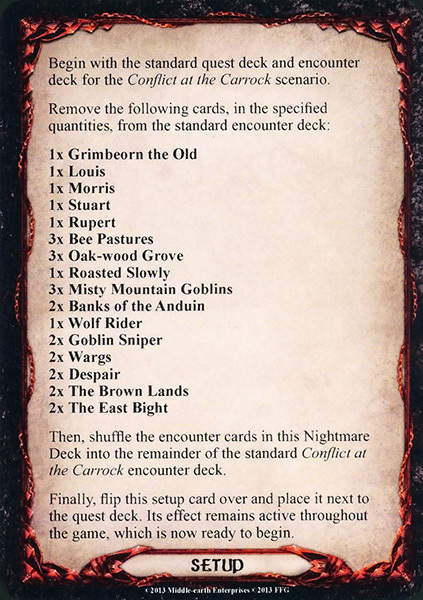 When Revealed: Place the unique Troll cards previously set aside into the staging area. Players cannot defeat this stage if there are any Troll enemies in play. While Louis is engaged with a player, all Troll enemies gain, "Forced: After this enemy attacks, the defending player must raise his threat by 3." Response: After defeating Louis, you may choose and discard 1 "Sacked!" card from play. While Morris is engaged with a player, all Troll enemies get +1 Attack. Response: After defeating Morris, you may choose and discard 1 'Sacked!' card from play. Forced: If Muck Adder damages a character, discard that character from play. Shadow: Defending character gets -1 Defense for the duration of this attack. 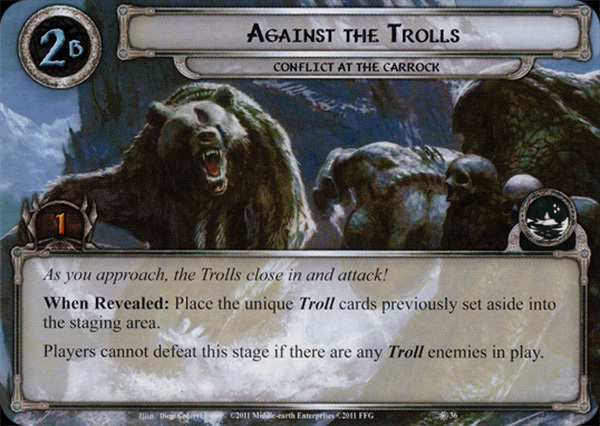 While it is in the staging area, River Langflood gets +1 Threat for each Troll enemy in play. When Revealed: Destroy all heroes with the card 'Sacked!' attached. Then, shuffle Roasted Slowly back into the encounter deck. Shadow: If attacking enemy is a Troll, remove 2 damage tokens from it. Forced: After Rupert attacks, shuffle all copies of the 'Sacked!' card from the discard pile back into the encounter deck. Response: After defeating Rupert, you may choose and discard 1 'Sacked!' card from play. Shadow: If attacking enemy is a Troll, resolve this card's 'when revealed' effect. While Stuart is engaged with a player, all Troll enemies get +1 Defense. Response: After defeating Stuart, you may choose and discard 1 'Sacked!' card from play. Immune to player card effects. 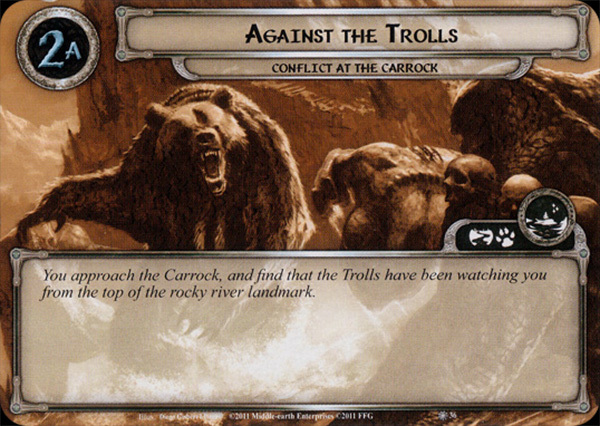 Players cannot travel to The Carrock except through quest card effects.While The Carrock is the active location, Troll enemies get +1 Attack and +1 Defense. While Savage Hill-troll is in the victory display, each Troll enemy gets +1 hit point. Shadow: If attacking enemy is a Troll, defending character does not ready during the refresh phase this round. Forced: After Rob and Bob makes its first attack each round, if there are two or more players, it engages the next player and makes an additional attack (discard and deal a new shadow card for this attack). Forced: After Louis attacks, the defending player must raise his threat by 3. While Louis is in the victory display, each Troll enemy gains, "Forced: After this enemy attacks, the defending player must raise his threat by 1." Immune to player events. While Morris is in the victory display, each Troll enemy gets +1 Attack and gains "Immune to player events.". Rupert's Defense cannot be reduced. 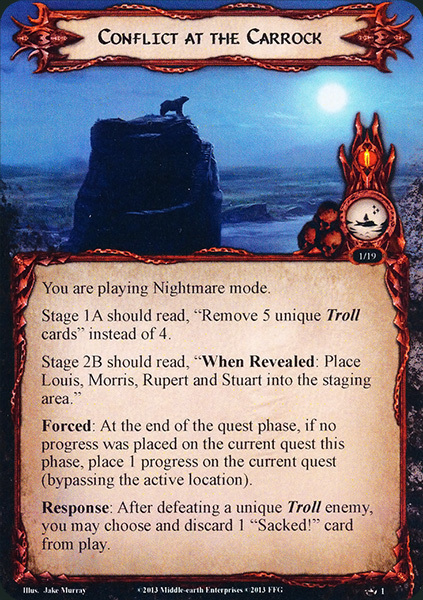 While Rupert is in the victory display, the Defense of each Troll enemy cannot be reduced. Cannot have player attachments. While Stuart is in the victory display, each Troll enemy gets +1 Defense and gains "Cannot have player attachments." Forced: After any amount of progress is placed on Hives and Hives, deal 1 damage to each character in play. When Revealed: The first player chooses a hero in any player's discard pile and removes that hero from the game. Then, heal all damage from each Troll enemy in play. If no damage is removed from any Troll enemy as a result of this effect, Time for Supper gains surge.